The CAN Star acts as a convenient way to add CAN nodes to the network. The CAN Star acts as a convenient way to add CAN nodes to the network. Nodes (such as CAN actuators, sensors, avionics devices etc) connect to the CAN Loop connectors using CAN Stars. They are available in a variety of configurations and connector options. 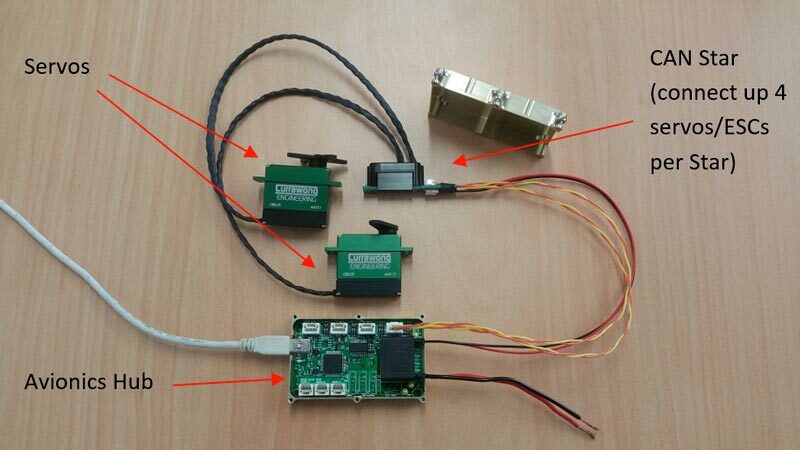 The following image shows how the Avionics hub, servos and a CAN Star connect together. There are a maximum of four servos and/or ESCS that can be connected to each CAN Star.